2018 Improvements include a 6' wooden privacy fenced backyard, a 10' x 16' Yoder built storage barn with a 4' x 16' covered porch; and more than half of the basement has been dry-walled. 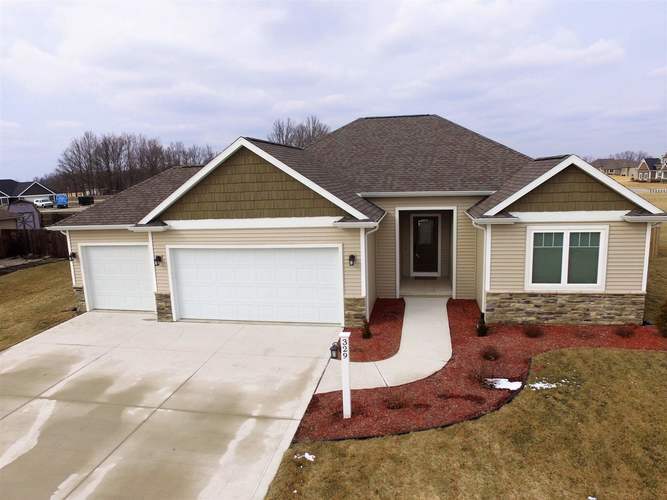 This quality built home with 3 bedrooms and 2 full baths features an open floor plan, custom kitchen cabinets with whirlpool stainless appliances. The great room features a stone fireplace with custom Bali motorized cellular blinds, 9' ceilings and Pergo flooring. Dining room has a large window facing the fenced large backyard. Master bedroom has tray ceilings. The master bath features double bowl vanity, ceramic tile flooring, a 5' fiberglass shower, and a large walk-in closet. The 9' deep full basement features 2 corner windows, framed and insulated exterior walls, and provisions in the concrete for a future basement bathroom. The 3 car garage has finished interior with Spanish laced ceiling, floor drains, 6' x 8' peg board tool wall, insulated garage doors, water spigot, and a pull down stairs for attic storage. Other features of the home would include a pre-wired media box for fiber optic, CAT5 and RG6; Trane high efficiency furnace, R38 insulation value over the heated area of the home. Immediate possession upon final closing. Directions:Take State Rd 1 North of Bluffton turn east onto Monroe St. then left on Fieldcrest Dr., then right onto Goldenrod Ct.